King of Lydia Croesus (560-540 BC) controlled most of western Asia Minor and made generous offerings to the temples of Delphi, Artemis and Didyma. In the 7th C BC the Lydians invented the first coinage in history. They developed methods to extract gold from metal ores. Some of the highlights are the temple of Artemis, one of largest temples in Asia Minor and the Roman Gymnasium complex. 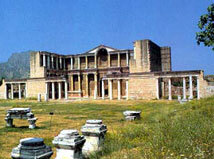 Part of the Gymnasium was converted into a synagogue in 3rd C BC. Sardis is one of the Seven Churches of Revelation.